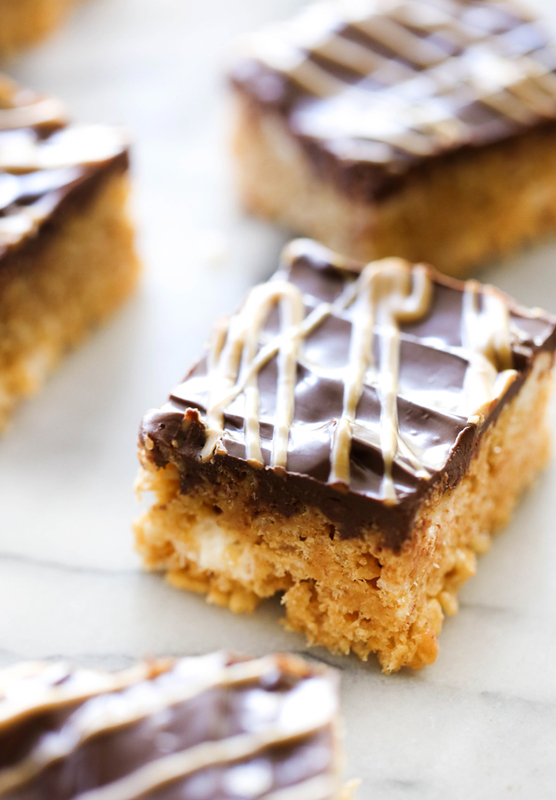 These Chocolate Peanut Butter Rice Krispie Treats are the perfect quick and easy snack! This recipe whips up in no time at all and is adored by both kids and adults. 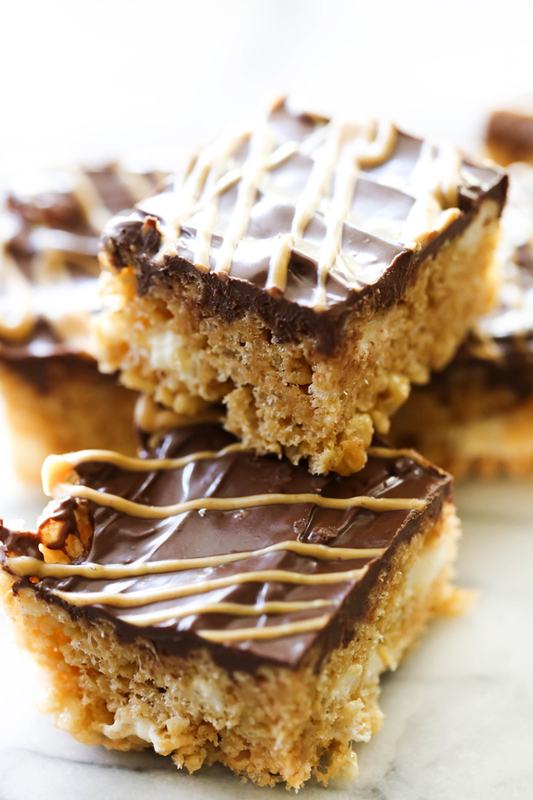 If you love chocolate and peanut butter then this is the treat for you! I knew life with 4 kids was going to be busy and hectic, but I underestimated just how much it would be. Growing up, my mom ALWAYS had an after-school-snack for us waiting when we got home. It was something I always looked forward to and something I could always count on. I always knew that I wanted to do the same for my kids one day. Sometimes I don’t always get around to making a homemade one so we go out for one after instead, but when I do make one for them, I know it means that much more to them. These Chocolate Peanut Butter Rice Krispie Treats are the PERFECT after-school-snack (or a great quick and easy snack for any occasion)! They are super simple and combine two amazing ingredients; peanut butter and chocolate. My family went CRAZY over these! Add 10 ounce bag marshmallows and stir until melted. Once marshmallows are melted, remove from heat and stir in peanut butter. Add Rice Krispie cereal and gently stir until all the marshmallow mixture is distributed evenly. Stir in mini marshmallows and then empty into the buttered 9x13 inch dish. Butter your hands and then press Rice Krispie mixture evenly over dish. In a small microwaveable bowl, combine chocolate chips and shortening. Microwave chocolate in 30 second increments until melted, stirring in between each increment. Spread chocolate over peanut butter Krispy's. In a small microwavable bowl, combine peanut butter chips and shortening. Microwave chips in 30 second increments until melted, stirring in between each increment. Drizzle over chocolate and allow the treats to set for an hour. How much peanut butter? It says 1/2 and 1/4. Also how many marshmallows it lists 10oz bag and 2 cups. Hi Sierra! I hope I can answer your questions clearly. I hope that helps clarify any confusion. Please let me know if you have any more questions, I am happy to help!